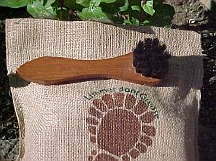 Horsehair applicator brush to apply boot grease. This brush will allow you to apply light, even coats of grease. Please remember that if the grease doesn’t sink into the leather completely within 15 minutes or so, at room temperatures you are probably applying too much.